Family of merchants; settled at Bordeaux, France. They originally came from Avignon, and refused to obey the decree of expulsion from Bordeaux passed by the jurats and Parliament of that city in 1734 at the request of the Portuguese Jews there. Successive decrees in 1739 and 1740 were likewise suffered to pass unnoticed, the Dalpugets plying their trade as linen merchants and building up quite a large business as bankers. In time the members of this family came to be looked upon as the leaders of the Avignonese Jews. In 1750 they were tacitly accepted as citizens of Bordeaux, although they still labored under certain disabilities, for the removal of which they and members of the Astruc and Lange families petitioned the king in 1757. In 1759 (July 14), letters patent of complete registration were granted to them. Emanuel, Israel, Jacob, Joseph, Manuel, and Salon Dalpuget were the most prominent members of the family, all being engaged in commerce at Bordeaux. Several of the female members were converted to Christianity. Th. 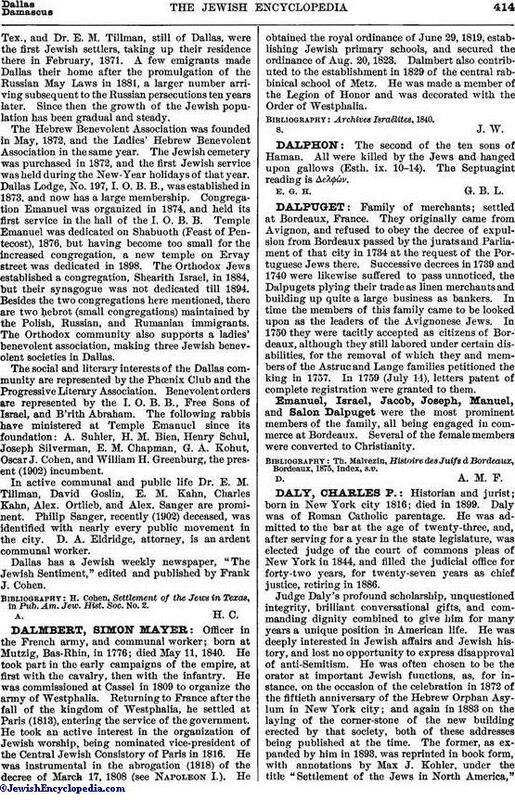 Malvezin, Histoire Juifs Bordeaux, Bordeaux, 1875, Index, s.v.